The Portuguese Water Dog is an affectionate, easy-to-train, eager-to-please, large-sized dog who does well as a family pet and tends to get along with other animals. The breed's name comes from its history as a fisherman's dog—the hardworking Water Dog retrieved fishing nets, carried messages between ships, and rescued shipwrecked sailors from the churning waters of the sea. A love of water persists in the playful Portie and they will seize any opportunity to splash around. The Portuguese Water Dog is also known as a Water Dog, PWD, Portuguese Fishing Dog, and Portie. Coat - The Portuguese Water Dog has a thick coat with no undercoat. The hair may be curly or wavy and comes in black with or without white markings, brown, and occasionally white. As the PWD has hair rather than fur, it will continue to grow if left unclipped. Because it is a low-shedding breed that produces less dander, the Portuguese Water Dog is considered a hypoallergenic dog and may trigger fewer allergic reactions. It's no accident the Portie has 'water' in its name—this working breed has origins in times long past, first described in the 1200s by a monk who observed a Portie-like dog pulling a drowning sailor from the sea. The breed was prized for its hardworking nature as a fishing dog and guard dog. Portuguese Water Dogs were indispensable on fishing ships—they were trained to herd fish directly into the fisherman's nets, to retrieve supplies, and even sailors, from overboard, and to run messages from ship to ship or from ship to shore. Swimming and working all day was easy for this strong, sturdy fishing dog. As the need for fishing dogs dwindled due to modernization in the fishing industry, so too did examples of the breed. Portuguese Water Dogs nearly went extinct in the 1930s, but fanciers of the water dog sought out these fisherman's dogs and worked to reestablish the breed. The Portuguese Water Dog first came to America in the 1950s and slowly gained attention. The Portuguese Water Dog Club was formed in 1972, and the AKC recognized the breed in 1983. The gregarious Portie is an affectionate, people-oriented dog who thrives with a job to do. Retrieving is a favorite pastime and fetch is a game he'll play diligently. The breed is active and requires plenty of exercise and mental stimulation to prevent undesirable behaviors due to boredom. Never to be taken too seriously, the Portuguese Water Dog has a sense of humor and will display his goofy side to earn laughs. Occasionally, Porties may be too smart for their own good—they may try to outsmart their owners, so a firm and consistent, but never harsh, training method should be practiced. Are Portuguese Water Dogs Good with Kids? Porties often make fantastic companions for children, though they are a high-energy breed that may knock over small children during play: their size should be considered. Because the Portie is a retrieving breed, expect him to be mouthy—discouraging and redirecting such behaviors from an early age is important. Are Portuguese Water Dogs Good with Other Pets? Households with other dogs and cats are often suitable for PWDs, but their high energy may not be a match for small dogs or cats unaccustomed to boisterous play. Other small animals aren't recommended to coexist with this breed. The loyal Portuguese Water Dog will probably bark to alert you of people approaching, but he is friendly and will likely greet guests with a wagging tail. PWDs are said to have admirable watchdog skills, but do not make good guard dogs. A high energy level means the Portuguese Water Dog requires plenty of exercise for health and happiness. The Portuguese Water Dog requires an abundance of attention. His high energy level calls for plenty of exercise. He is fond of retrieving and chewing objects. Because he is bouncy and enthusiastic, he may knock over children or even adults. You must give him a job to do. He may become destructive if bored. Indoor If provided with time outdoors, plenty of mental challenges, and physical activity, Porties make wonderful indoor companions. They may be needy as they bond strongly with their people, so expect a PWD to keep its family within sight at all times. With enough exercise and attention, Porties may be able to adapt to life in an apartment, but they need plenty of time outdoors to exercise. Outdoor As a social breed, the Portuguese Water Dog relishes time spent outside with family but does not do well being left alone outdoors. They are known to scale fences and should not be left in a yard alone. Exercise At least 40 minutes of exercise—more is better—is recommended per day for the boisterous Portuguese Water Dog. Without enough exercise, the breed may become destructive or disobedient due to boredom. Endurance Portuguese Water Dogs were bred for the stamina to work all day. They're not likely to slow down until the job is done. Because the Portie is so driven, it is important to observe for signs that he is overworking himself, as he isn't likely to stop on his own. Running Miles: Healthy, well-conditioned Portuguese Water Dogs make wonderful running partners and may be able to run more than five miles. 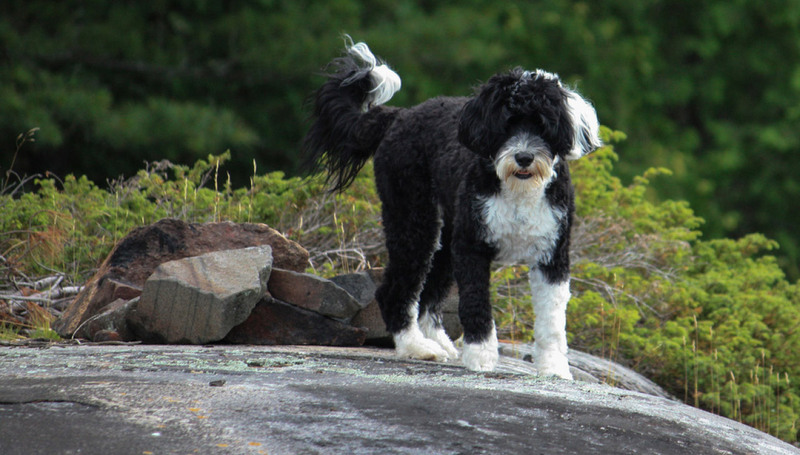 Hiking Miles: The Portuguese Water Dog is a top pick as a hiking companion. If fully grown, a Portie may be able to hike up to 10 miles. Food The Portuguese Water Dog requires two to three cups of high-quality dog food daily, based on average weight and activity level. This amount should be split between two meals, or given in a food-dispensing puzzle toy. Portuguese Water Dogs do not tend to guard their food more than other breeds, but children should never be allowed to touch or remove food while the PWD or any dog is eating. Alone Time Time alone is difficult for the family-loving Portuguese Water Dog. While they may be left alone for four to six hours during the day, this social breed may become destructive if not provided enough attention or exercise. Crate training may be necessary to prevent destructive behaviors. Brushing weekly and bathing as necessary will help keep the Portie's coat in top condition. Trips to the groomer every four to six weeks is necessary to have the coat clipped. Though the coat sheds minimally and the PWD is considered hypoallergenic, the breed does still shed. Trimming nails regularly will help prevent painful splitting, cracking, or breaking a nail. You can minimize serious health concerns in a Portuguese Water Dog by purchasing him from a reputable breeder who engages in responsible breeding practices, and through screening for common diseases and conditions. Intelligent, easy-to-train, and willing-to-please Portuguese Water Dogs learn basic obedience quickly. Teaching a Portie basic manners—like not jumping up, and walking politely on lead—and discouraging mouthiness in play as early as possible, is important. Burn some of that extra energy a Portuguese Water Dog possesses with advanced tricks and obedience training. The Portie loves learning and spending time with people, and the effort that goes into mastering new tricks can help tire out this energetic breed. The love of water runs genes-deep, so dock diving and other water sports will put a Portie in his element. Agility offers another fantastic way to give a PWD the exercise he needs. Originally used to herd fish into nets and retrieve from the water, the Portuguese Water Dog can perhaps learn gundog skills. They may be trained to retrieve or flush, and will not balk at getting into the water. They were bred for long, work-filled days and have the stamina to accompany you on hunting treks. According to the breed standard, Portuguese Water Dogs should have a curly or wavy coat, but some PWDs are born with an 'improper coat.' This means that the dog has a coat inconsistent with the breed standard and is not suitable for the conformation ring. They may be referred to as smooth-coated, flat-coated, or smooth-faced—for none of which should a breeder charge extra, as this does not make the dog a rare example of the breed. If a breeder claims as much, they are trying to pull one over on you. An improper coat can be identified by a few weeks of age. There is now a genetic test available to detect the presence of the recessive gene that causes improper coats in breeding dogs, so a breeder may choose to test their dogs before breeding to prevent passing the gene. Improperly coated Portuguese Water Dogs will likely not be hypoallergenic as they tend to have a double coat that sheds. If you don't plan to show or breed him, there's no reason to pass up a Portie for an improper coat, as these dogs won't suffer from any additional health concerns and can still make wonderful, loving companions. Do Portuguese Water Dogs Have Webbed Feet? Yes, Portuguese Water Dogs have webbed feet which historically helped them perform their duties as fishing boat dogs. Do Portuguese Water Dogs Like to Swim? If there is water nearby, you can about bet any Portuguese Water Dogs in the vicinity are biding their time until they're allowed to jump into it. Porties have a strong love for water. Because of their impressive swimming capabilities and fondness of water, Portuguese Water Dogs were tasked with the retrieval of 'splash hits'—home run hits that left the ballpark and splashed into the Bay—for the San Francisco Giants in the 1990s. The team of six Portuguese Water Dogs was known as BARK, or the Baseball Aquatic Retrieval Korps. The Portie-retrieved baseballs were coveted amongst fans and were sold as collectors' items, and the money BARK earned was donated to local animal rescue organizations.